There are those who are always happy to blame New York City for those who have misfortunes -- or who somehow seem changed -- or who at least have memories not shared by their friends back home -- after a visit to that great metropolis, and, as this song of more than a century ago shows, it is not exactly a new phenomenon. Yup, New York City CAN change your life. 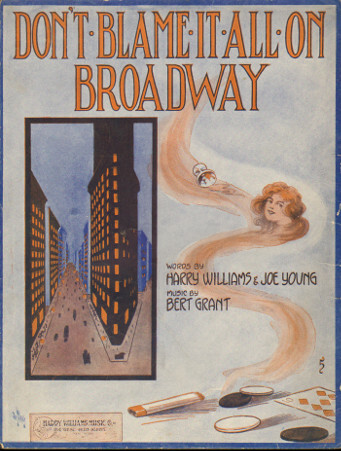 We are happy to offer the original sheet music of Don't Blame It All On Broadway for download as a PDF file. The download includes the colorful original cover, and the price is $3.50. Charge it to your credit card or PayPal account. Thanks to the YouTube user called "MusicProjectX" we are able to bring you The Peerless Quartette's rendition of Don't Blame It All on Broadway. Well, what do you think of this one? A little social history embodied in song? Like it? Want to try it on your own piano (or other period-appropriate musical instrument)? Perhaps that old upright piano in your own front parlor? Then, by all means, get the sheet music! Please CLICK HERE to return to our main SHEET MUSIC page. Since we mentioned Broadway we would be remiss to mention that our intern, Eleanore Jenks, as well as loving local history, is a huge fan of Broadway theatre -- you might even call her a Broadway lover! She's also pretty knowledgeable about the theatre in general, and she shares some of her knowledge via her blog, which is entitled: "Broadway Lover: Everything Broadway". If you have a few minutes, take a look at her blog, which you can find at Broadwaylover.org -- we think you'll enjoy it!